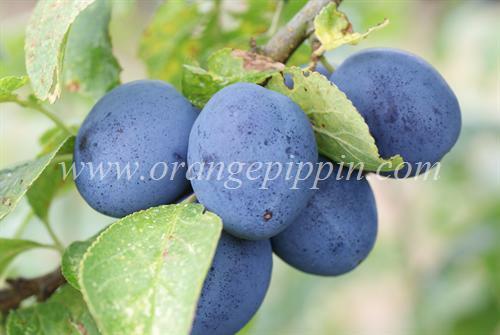 Czar is a large dark black/purple early-season plum, with good astringency and useful for culinary purposes. It can also be eaten fresh if you leave it to get fully ripe. The blossom is a notable characteristic, being unusually large for a plum. The Victorian fruit enthusiast and author Robert Hogg was sent some samples in August 1874 by the growers, Rivers of Sawbridgeworth. This was the year of its first fruiting. Hogg subsequently rated it as an "excellent plum". Rivers named it Czar in honour of the Czar of Russia, who visited England that year. Czar soon become a popular garden plum in English gardens, being easy and reliable to grow (thanks in part to blossom which has some frost resistance), and producing good crops. Although the flavour is not necessarily the best, it is one of the earliest culinary plums in the season. The tree can also grow in partial shade and is hardy enough to tolerate north-facing situations. Very prolific cropping plum. Easily maintainable tree with self fertile habit and good disease resistance. Flavour of fruit is good when plums are allowed to ripen properly but they do not keep well in my experience. Good dehydrated for storage and makes nice jams and chutneys. The wine made from this variety was ok but loses taste so is best blended.